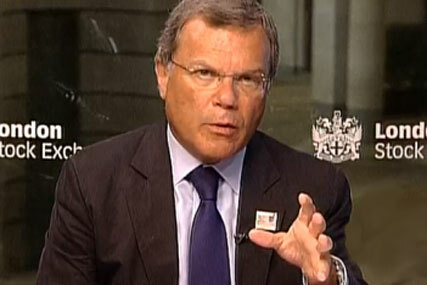 WPP has reported its like-for-like UK revenues increased by 5 per cent in the first four months of 2013, as 99.98 per cent of shareholders voted for the re-election of the chief executive, Sir Martin Sorrell. In a trading statement published to coincide with WPP’s annual general meeting today, WPP reported global revenues of £3.45 billion in the first four months of 2013, up 6.7 per cent year on year. When the impact of acquisitions and currency fluctuations are excluded, like-for-like global revenues increased by 2.3 per cent compared with the first four months of last year, an improvement over the year-on-year increase in the first quarter of 2013. In constant currency global revenues increased by 5.4 per cent year on year, which WPP said reflecting the weakness of the British pound against the US dollar and euro. Revenues from advertising and media investment increased by 5.1 per cent over the first four months with like-for-like growth of 3.5 per cent, the strongest performing sector (as it was in the first three months). WPP said in the UK advertising and media investment management, consumer insight and direct, digital and interactive performed particularly strongly. In constant currency WPP's UK revenues increased 13.5 per cent. At the AGM today 90.65 per cent of shareholders voted in favour of Phil Lader’s re-election as WPP chairman, despite him announcing his intention to resign in April. Just under a fifth of shareholders (19.42 per cent) voted against the company’s remuneration report.